Up to 30 free issues are being offered (only 1 per customer), through October 15, 2018! 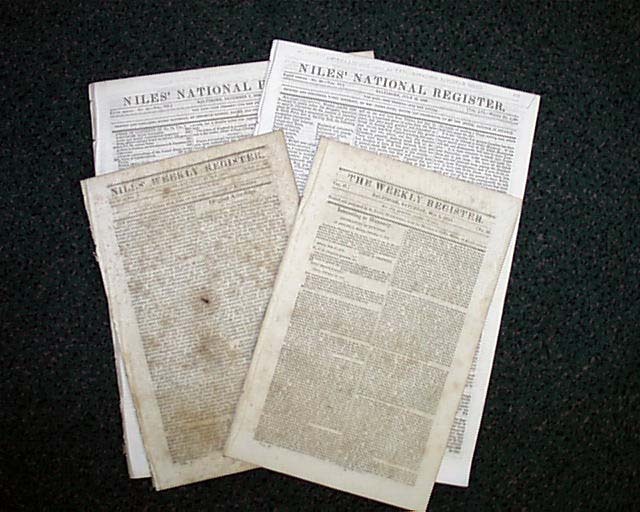 The national and international newsweekly Niles’ Register is well known today primarily to collectors & those and genealogists who have sampled its treasures. But in the first half of the 19th century, the Register was as well known as the New York Times and Washington Post are known today. You can read about it more on our History's Newsstand Blog. U.S. destinations - only $5. If this issue is added to an order containing at least one other item and the order is less than $100, the additional S&H for this item is only $1. If the order is for $100 or more, the S&H for the "free" issue will be on us. Non-U.S. destinations - S&H is calculated by weight - as per usual. Note: The images shown are only representative of what you will receive. More than one issue is showing to show the variations of the single issue you will be receiving. This listing is for one issue.